All homes built at Galiano Green must comply with current building regulations and building code. All designs must be approved before building commences, and all homes MUST include Rainwater Catchment as the homes principal water supply. There are lots of designs and plans available as open source documents on the internet. 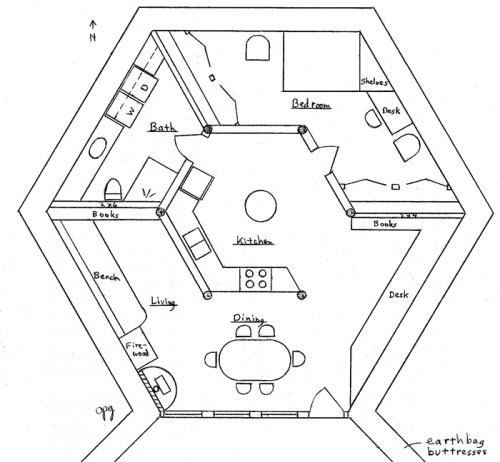 Also, there are a variety of kit homes, which include everything you’d need in order to build. There are lots of designs and plans available as open source documents on the internet. Also, there are a variety of kit homes, which include everything you’d need in order to build. Here are a variety of plans that might work on Galiano Green, as well as downloads for Google Sketch-up, which is a great program to use to design your own home if you want to go that route. This 952 sq. ft 1 bedroom 1 bath single story natural/modern cottage features your choice of strawbale, straw-clay, or dense-pack cellulose double-wall construction to achieve superinsulated standards. Designed for passive solar, this home will be non-toxic, functional, and extremely energy-efficient. Flooring options include polished slab on grade, Siding options include lime stucco, pine, white oak, or black locust siding. This 480 sq. ft house (without loft) is a single story with one bedroom, bathroom, kitchen and living/dining areas. This 480 sq. ft house has a loft that can accomodate two beds. It has a bathroom, kitchen and living/dining areas. View the plans on the Dream Green website.